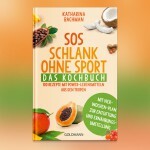 Das Buch SOS - Schlank ohne Sport. Das Turbo-Stoffwechselprogramm aus den Tropen. In this book, you will learn how an Indian doctor from Malaysia helped my husband and I get fit, slim and, above all, healthy again within a very short time. No mysterious brew or any magical "magic pill" helped us to achieve this "miracle," but the millennia-old knowledge of the Indians, Maya and Aztecs, and much more. Since then we are happy and content again and are enjoying our exciting life. We are convinced that you too can experience such a miracle! With a detailed detoxification plan, 80 delicious and easy-to- cook recipes, and many useful tips, the program can also be easily implemented by you. Forget about all the diets known to humanity so far and kiss your over-weight and your cellulite good-bye! This book tells you how an Indian doctor in Malaysia guided my husband and me back to being slim, fit and most importantly, healthy in a very short period of time. This "miracle" is not attributed to any mysterious magic pill or potion, but to ancient Indian, Mayan and Aztec wisdom. We have been happy and content again ever since, enjoying our new exciting life. We're convinced that you too, can experience the same miracle! Admittedly, the title of this book sounds provocative because losing weight without exercising is by no means desirable for everyone, nor is it necessarily healthy from a medical point of view. But in the following, you will find out how we - that is, my husband and I - succeeded in doing so despite all odds. The catchy title was aimed at enticing you - yes, you, dear reader! - to buy this book. Which, apparently, I have managed to do. The reason is simple: I wish to make money. This may disappoint or even shock you. However, there is no need for that, since it is only part of the whole truth. Of course I want to profit, among other things, by my efforts. Who wouldn't? The rest of the truth, however, is far more important for you personally! I would like to share with you the wonderful feeling of losing many pounds within a short time, so that you also can experience it. My success story can become your success story. If you want it to. First of all, I am not telling my story as a medical doctor, but as a writer. I want to share with you, in detail, how my husband and I each lost over 24 pounds (!) in three months, simultaneously detoxifying our bodies in the process - in my case, without any exercise at all. Besides having lost all those excess pounds, I found especially gratifying that my cellulite had suddenly vanished as well! Along with the undeniable health benefits, for me, this was the proverbial "cherry on top". The sole purpose of this book is to answer the question: How on earth did my husband and I manage to lose weight, get back into good shape and become completely healthy in such a short time? Before starting with Doctor K. S.'s program, I was extremely skeptical. In the past 20 years, we had tried several slimming cures and diets, breaking some of them off, following through with others. Yet none kept their promise, and when there were any results, they were middling and short-lived. On top of that, I found calorie counting really annoying, the same as constantly having to watch my figure, exercise, and all the rest of it. I was frankly sick and tired of having to give up this, that and the other thing - all this never ending self-torture and the requirement to exercise, exercise, exercise. I simply hate exercising! Always have. So, if you're imagining the proverbial couch potato, that's me! That is why I especially admire all those people dutifully jogging and gladly hitting the gym with vigor and enthusiasm. I had resigned myself to the fact that, after a certain age, it was normal not to have jeans, skirts and t-shirts in size S in my closet - not to mention XS - and that my clothes would come in circus-tent sizes from now on. And at my age, I no longer had much interest in looking like Twiggy anymore anyway. All told, I had come to terms with obesity, overweight, high blood pressure, diabetes, high cholesterol and shortness of breath when climbing stairs etc. I never dreamed I could ever go back to wearing a size 10, having a decent figure and normal blood pressure, sugar, and cholesterol readings, or that my ever swollen belly would disappear. So - aren't you curious now about all that I have to tell you? At this point, I would like to thank you very much for buying my book. The small price you have paid will help repay the cost of Doctor K.S. 's program. I must say, getting my health back and slimming down turned out to be fairly expensive, especially because, among other purchases, I needed a completely new wardrobe, along with several new pairs of shoes - mine had all become too large! And everyone knows what a big deal buying shoes is for us women, right? Now, once you have successfully lost weight, please tell all your family, friends, colleagues, neighbors and anyone else you can think of to read this book. I wish you great success from the bottom of my heart. P.S. : This is to be regarded as a guideline and inspiration, rather than a set of unpleasant instructions - it should give you courage and enthusiasm for a new beginning! 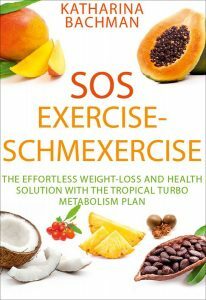 SOS EXERCISE – SCHMEXERCISE can be ordered from all major book stores.